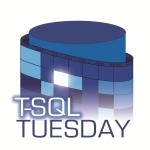 Have you heard of T-SQL Tuesday? I hadn't until recently, but it's a series of monthly blogs started by Adam Machanic ( blog | twitter ) some years ago (well, 42 months ago, one presumes) for all to participate in. The idea is that each month someone hosts it, that person sets a topic which we all post to and link our post to twitter using the hash tag #tsql2sday. I've been using databases (predominantly of the Microsoft variety) for more years than I care to remember now, having started with data entry before rapidly moving on to programming Access (v95? or possibly as early as v.2.0) databases as part of my first full time job (not what I thought I'd be doing, but a good use of what was until then just a hobby). I soon moved onto using SQL Server as well, in about the year 2000. I've dabbled with other technologies, spent time programming, dealt with business administration, but generally it was data management that I enjoyed, and that remains my area of focus. The technology has changed somewhat, but the core concepts remain remarkably unchanged. I've changed how I work, have worked with large companies and small, and every challenge is different. Fundamentally I think that the ability to speak to all levels of the business is required as a data professional - you need to be able to connect with the CEO who wants a key metrics view of the business' information, the data entry clerk who has to record the information, the developer who has to build the system, the IT department who have to manage it and the CFO who wants it all done for no money. Of course none of them want to hear that the solution isn't absolutely perfect (ideally with respect to what is needed in the future), or needs maintenance - but that's all part of the fun! If I had to say what technology had changed my working life more than any other, it's probably the Internet. Not the protocols, or changes to how I interact with data, but the ability to interact with my peers on demand, and help learn by engaging with other professionals - and amateurs - as they look at their own data challenges. It's introduced me to many more fellow-professionals than I thought existed, the talked about #sqlfamily. I recently posted about how the Internet can help you find your next role, and also how to connect with the community, and I would also point to Q&A sites like ask.sqlservercentral.com and stack overflow. They're a great source of knowledge and expertise if you need inspiration on a problem, and I have found that by digging into other peoples' questions that interest me I've learned a lot myself. This helps steer my career, by way of introducing me to new technologies I may otherwise not have looked at. I have worked with Microsoft SQL Server since version 7. My background includes working as a Database Developer, systems integrator, ETL specialist, DBA and Data Architect. I am a member of SQL South West User Group, and occasionally present or blog about topics which interest me. When not facing a computer screen I can be found walking, usually by the sea. I can be contacted on twitter at @d_a_green or on LinkedIn. Content copyright Dave Green 2011-17. Simple theme. Powered by Blogger.